Fig. A-249. Todd-AO Editing Machine as modified from the Westrex machine. The optical system has been designed to handle the wide film and to improve the image quality. A periscope has been added on the back of the machine to permit projecting the picture with the film basket in place. Interlock gearing between sound and picture side provides for the film speed difference between sound and picture film for the Todd-AO Process. The speed control for the variable speed side can be seen on the outside of the right-hand leg. Fig. A-244. Todd-AO Editing Machine with the optical modifications but without modification on the sound side. The external focus knob can be seen on the left-hand side between the two pulling handles. The Todd-AO Editing Machine has been modified from the Standard Westrex machine to suit the needs of the Todd-AO Process and to provide the film editor with great flexibility. The optical system has been completely redesigned to give very high image quality with the 65mm or 70mm Todd-AO film. An additional periscope has been added to permit projection of the picture on a wall or screen even with the rear film basket in place. 1. A complete second sound film head built onto the machine so that two six-channel sound films may be run simultaneously with complete selection as to which track or combination of tracks are played. 2. A running time counter as well as footage counter. 3. Auxiliary film reel shaft and dynamically damped tension rollers to accommodate 2000' reels instead of the standard 1000' reels. 4. 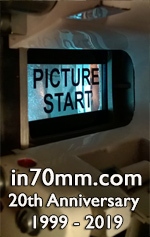 17.5mm sound film guides so that either 17.5mm optical or magazine sound film can be used. Fig. A-248. Front view of the Todd-AO Editing Machine with the optical modifications but without modification on the sound side. Fig. B-29. Close-up of the sound side of the Todd-AO Editing Machine with modifications. The sound head can accept either six channel magnetic sound on 35mm sound film, single channel optical sound on 17.5 or 35mm photographic film or one, two, or three channel magnetic sound on 17.5mm magnetic sound film. Shown here is 17.5mm magnetic film, and three of the six pickup beads can be seen. In all cases, the heads are below the film to provide better contact on magnetic film. Fig. B-31. Front view of the Todd-AO Editing Machine. This view shows the extra complete sound head that may be added as a factory attachment. This additional sound head permits running up to two complete six-channel sound films simultaneously. Electronic mixing of any or all six tracks on each of the two films with acoustic mixing being used between the two films. Six selector switches for each head can be seen below the individual loudspeakers to control this mixing. This machine has an additional attachment, seen above the viewing screen, which permits the use of 2000' film reels. Continuously variable phase shift between sound and picture film for synchronization can be accomplished by means of the control knob shown on the top left of the machine. Fig. B-30. Close-up of the two six-track sound heads on the Todd-AO Editing Machine. Westrex Editor modified for Todd-AO. The Westrex editor was replacing the old Moviola editors. The editor has two film drives, one for the picture and the other for sound film. These can be driven forward or reverse at variable speed while keeping the picture and sound in sync. The Todd-AO modifications included a new rotating prism system for the larger picture film side, and a rear projection system to give a relatively large viewing image instead of the small screen normally used for 35mm images. This shows the editor from the front. Editor partial side view showing the mirror for the large screen projection. Editor projection screen with image showing. Fig. A-268. Front view of the Todd-AO Enclosed Power Rewind for review room projection booths in localities where it is required by law. Three types of Todd-AO Film Rewinds are supplied. The Todd-AO Enclosed Power Rewind is used in review room booth installations where an enclosed rewind is required by law. The Todd-AO Torque Motor Rewind is an open-power rewind designed for mounting on the editing bench. This rewind permits either rapid rewinding or slow rewinding for inspection purposes. It is operated in either direction by means of a reversing foot switch and the torque motor drive is designed to permit stalling of the motor for an indefinite period without harm. Fig. A-267. Todd-AO Enclosed Power Rewind showing method of loading film. Either 3-phase torque motors of single-phase torque motors may be supplied, although the 3-phase motors are recommended where 3-phase power is available, as they give smoother operation. The Todd-AO Manual Rewinds come in pairs with a brake end and a free end and are designed to accommodate up to 5000' film reels. All of the Todd-AO Rewinds have the Todd-AO standard ½" shafts to take the Todd-AO film reels. Fig. A-265. Rear view of Todd-AO Enclosed Power Rewind showing safety interlock switch and automatic limit switch which shuts the motor off when the reel is finished rewinding. Fig. A-278. Torque motor driven Todd-AO Editing Rewind. The rear view is shown with the rewinds, motors and belting. In normal operation, the belt is arranged to come up through a slot in the table. The rewinds are provided with spring loaded crank handles for manual operation when desired, and with screw adjustable brakes on each part so that stopping time can be set at the operator's option. Either three-phase or single-phase motors can be supplied, although the three-phase motors are recommended wherever possible because they provide smoother action. Fig. A-302. Front view of the Control Box for the Todd-AO Torque Motor Rewind with foot control switch. Fig. A-301. Rear view of the Control Box for the Todd-AO Torque Motor Rewind showing receptacles for the two drive motors. Fig. A-277. Foot Switch for the Todd-AO Torque Motor Rewind permits driving the rewind in either direction with a touch of the foot. Fig. A-284. Todd-AO Timing Stand and Todd-AO Manual Rewind. These timing stands are useful for laboratory use in timing prints. One half of one of the Todd-AO Manual Rewinds is shown mounted on the Timing Stand. These rewinds have a 5000' capacity and are provided with a free end and a brake end. Fig. A-281. Todd-AO Film Reels in shipping cans. Shown here are 1000' and 2000' 65mm reels. Reels are available in 1000', 2000', and 3500' capacity in either 65mm or 70mm width. They all have the standard Todd-AO ½" shaft hole with double keyway. Fig. A-255. Todd-AO Treadle Splicer, front view. This versatile hot splicing machine is designed to handle the Todd-AO 65mm or 70mm film. It also has retractable pins so it can splice 35mm film. There are two models, one for Negative, giving a .070" splice, and one for Positive, giving a .085" splice. A treadle operated professional splicer and a bench model splicer are available for splicing Todd-AO 65mm and 70mm film. Fig. A-256. Side view of the Todd-AO Treadle Splicer with film ready to make a splice. After a great deal of research on film splicing, two Todd-AO standard splice widths have been arrived at as giving the optimum combination of holding power and flexibility. These are .070 inches for Todd-AO negative and .085 inches for positive. Both types of Todd-AO Splicers are available for either negative or positive splicing, and they provide means for scraping the base side as well as the emulsion side of the film for use with color stock. The Todd-AO Treadle Splicer is a hot splicer for editing or laboratory use. Retractable pins are provided so that it may also be used for 35mm splicing as well as for splicing 65mm or 70mm Todd-AO film. Fig. A-258. Front view Todd-AO Treadle Splicer with film ready to make a splice. The Todd-AO Bench Splicer is a small, portable hand-operated splicer for use in the projection booth or elsewhere. It may be provided with a heating element as optional equipment. Fig. A-254. Close-up of the Todd-AO Treadle Splicer showing a complete splice. Fig. A-79. Todd-AO Bench Splicer. The sloping block shown on the left-hand top platen serves as a depth gauge for the special multi-point scraper. This permits scraping every splice to the same depth to .001". This splicer can be supplied either with or without heating elements. The special hold-down shoe shown spring loaded on the right-hand platen gives even pressure across the full width of the splice, and a high enough pressure to ensure reliable splicing. Small hand film splicer shown with one side open. Hand splicer with both sides open. Hand film splicer side view with 65mm film. Fig. A-65. Exploded view of the Todd-AO Bench Splicer.